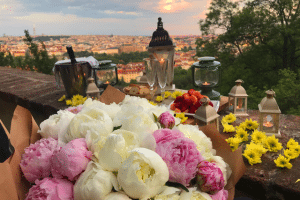 So, you’re in Prague for her birthday, and you want to do something very special, right? Well, look no further, because I’m about to tell you I’ve got everything taken care of! 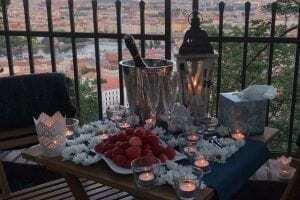 Her birthday in Prague will be something she will never, and I do mean never forget! Let me ask you: how many times have you actually surprised her to the point when she smiles, and tears of happiness pour down her cheeks? I mean really? How many times did you do something out of the ordinary? Something she tells all of her friends about over and over again until they’re tired of hearing it. The real answer is: not that many. If ever. 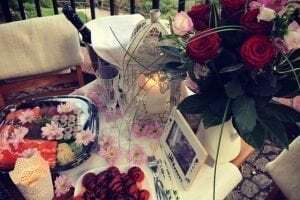 But you’re a click of a button away from making it happen if you’re planning to celebrate her birthday in Prague. It may sound funny, but I can make you a hero. I can make all of her friends jealous of a man, who pulled off something like that for his girlfriend’s birthday. And the good part is – you don’t have to do anything at all. Everything is going to be taken care of. 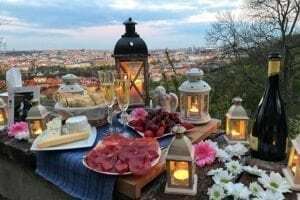 Some tasty snacks, a bottle of champagne or wine, fruit under chocolate topping, and a bouquet of her favorite flowers… All set up at a secluded location in one of Prague’s beautiful parks overlooking the city going into the night. Your only job is to take her on a walk through the park, and (using my detailed instructions) casually “stumble” upon the setup. 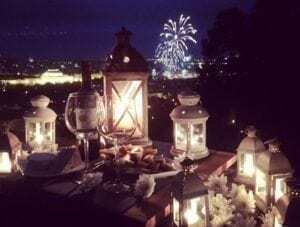 From my experience I can guarantee you, that this birthday in Prague will beat all of her previous birthday celebrations combined. If not all future ones. I mean, OK, you can go to a restaurant… But a month later she is not even going to remember the name of that place, let alone what she had for her birthday dinner. But let me assure you: 2 years later when you come back to Prague she will lead you to the exact same spot where you surprised her. Simply because things like that are never forgotten. Oh, and just imagine the number of times she’s gonna tell that birthday in Prague story to everyone she knows! Because who are we kidding here: girls love these romantic stories! Founder and owner of Prague for Two.